Janine Strafaci interviewed in “The County Woman” – ShoreTV New Jersey – Watch It, Live It, Love It. 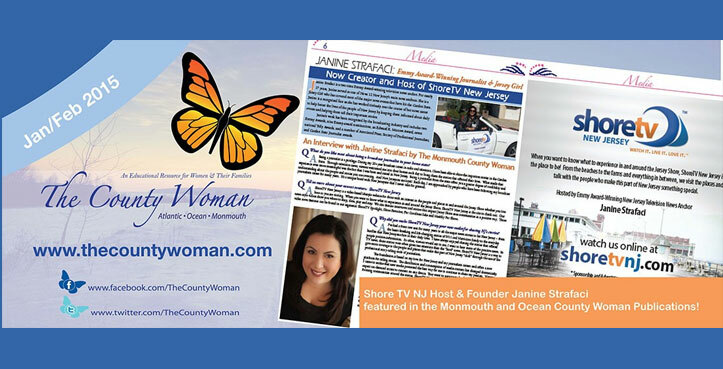 ShoreTV New Jersey host Janine Strafaci was recently featured in the January/February issue of both the Monmouth County and Ocean County versions of The County Woman Magazine! Janine Strafaci is a two-time Emmy Award-winning television news anchor. For nearly 17 years, Janine served as one of News 12 New Jersey’s main news anchors. She is a Jersey Girl who has covered most of the major news events that have hit the Garden State. Janine is a recognized face as she has worked tirelessly over the course of her news career to help better the lives of the people of New Jersey by keeping them informed about daily events and helping them tell their important stories. Emmy Awards, nine Emmy-award nominations, an Edward R. Murrow Award, seven national Telly Awards, and a number of Associated Press, Society of Professional Journalists,and Garden State Journalist awards.